The Senate Banking, Housing and Urban Affairs Committee today rejected President Trump’s nominee to be President of the Export-Import (ExIm) Bank. All 11 Democrats and two of the 12 Republicans voted against confirming Scott Garrett for the position. Garrett is a former Congressman from New Jersey who steadfastly opposed the Bank’s existence while a member of the House and was unable to convince enough committee members that he now supports it. 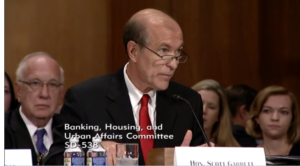 Scott Garrett, President Trump’s nominee to be President of the Export-Import Bank, testifying at his confirmation hearing before the Senate Banking Committee, Nov. 1, 2017. Screengrab. Senators Tim Scott (South Carolina) and Mike Rounds (South Dakota) were the two Republicans who voted against Garrett’s confirmation. The committee approved the nominees for the other four open positions on the Bank’s Board of Directors: Kimberly Reed to be First Vice President; and Judith DelZoppo Pryor, Claudia Slacik, and former Congressman Spencer Bacchus III to be members of the Board. Mark Greenblatt was also approved to be the Bank’s Inspector General. All of those nominations still require approval by the Senate as a whole. Created in 1934, the Bank helps provide financing for U.S. exports, including those in the aerospace sector such as communications satellites. The Bank needs to be periodically reauthorized, a step taken with little notice until recently when it became a major source of contention in Congress. Some conservative Republicans and liberal Democrats oppose the Bank on the grounds that it is a government subsidy — corporate welfare for a few big companies like Boeing and General Electric — while others hail the Bank as an important jobs creator by facilitating U.S. exports. The Bank’s authority to issue loans to foreign customers seeking to buy U.S. goods lapsed for several months in 2015. The chairman of the House Financial Services Committee, Jeb Hensarling (R-Texas), adamantly opposed the Bank and refused to bring legislation to the House to reauthorize it. The authorization expired at the end of June 2015. Advocates of the Bank employed a rarely-used parliamentary procedure to move the bill from committee to the floor without Hensarling’s approval. It passed the House and Senate and President Obama signed it into law on December 3, 2015. That was the good news. However, the Bank’s board requires a quorum of three of its five members in order to approve loans over $10 million. It has not had three members since that time. The Republican-controlled Senate refused to consider any of the nominees proposed by President Obama. Earlier this month, Charles Hall, who was acting Chairman and President of the Bank, resigned. President Trump opposed the Bank during his campaign, but now supports it. He sent a list of nominees to the Senate, but Garrett’s immediately encountered opposition. 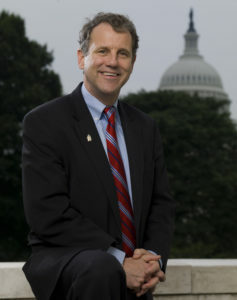 Sen. Sherrod Brown (D-Ohio). Credit: Brown’s Senate website. Brown listed the National Association of Manufacturers, the Chamber of Commerce, the Aerospace Industries Association, the Ohio Manufacturing Association and many small businesses as opposing the nomination. Democrats urged committee chairman Sen. Mike Crapo (R-Idaho) to move the other nominees to the Senate floor for confirmation immediately. What happens next is the big question. The Senate could confirm the other four and give the Board a quorum for approving loans above $10 million. One could be appointed as acting President. Alternatively, Crapo could hold all the nominations at the committee level, waiting for President Trump to nominate someone else to be President.